This is a guest post by Theramus, a college professor in a field unrelated to finance. He has looked at the relationships shown in this post as a hobby. A cause for the financial crisis of 2008 is described that differs from conventional wisdom. It is proposed that in the early 2000s, an increase in the volatility of oil took place. This increase in oil volatility had an impact on investment risk in general, and led to incentives to promote self-interested cashing out rather than protection of shareholders. Novel data will be provided to show that a distinct series of pulsed spikes in oil price volatility initiated in the early 2000s. The oil shock of 2008, when price doubled over less than a year (peaking at ~ $140 a barrel), is shown not to be an isolated event. Instead, the oil shock of 2008 is the largest in a series of 7 prominent spikes in oil price variance that began some 7-8 years ago. The multi-year pattern of spiking instability in oil price appears to be unprecedented, is ongoing and may be a natural process that results from initiating or being on the down-slope of the production curve since "Peak Oil". 2) Unregulated value extraction (i.e. looting) from this sequestered pool of capital. Finally, data will be described as to how a volatility spike in oil price in 1986 and a subsequent crash in the stock market in October 1987 (Black Tuesday) may have provided a key teaching moment. Lessons learned on the economic impact of a large transient variance in oil price from "Black Tuesday" may have been a factor guiding the avaricious behavior of Wall Street in the lead up to the financial crisis of 2008. "I have found a flaw… I don’t know how significant or permanent it is. But I have been very distressed by that fact…." A reflexive media and commentators jumped on a bowed Mr. Greenspan for the usual depressing reasons. However, had Mr. Greenspan let his mask slip for a moment? Notable words in his response included “…how significant or permanent…”. By using this phrasing could Mr. Greenspan have been signaling that he’d not been wrong previously (as if)? Instead, was he suggesting that conditions in the economy had changed in a manner that now made his old way of thinking flawed? This idea explores a possible cause for Mr. Greenspan’s distress. In short, it proposes the outline of a mechanism for how volatility in the price of oil might have contributed to the apparently irrational actions of the financial industry. In particular, it speculates how a recent upsurge in the instability of oil pricing might have provided a rational basis for altering the incentives of global finance. 1. Global oil production starts becoming constrained around the year 2000, on its way to peak, as predicted by Hubbert. 2. A new pattern of volatility in oil price emerges shortly thereafter and this pattern continues to build through the present (and into the future). 3. This new type of volatility is in the nature of being on the production down slope of a finite resource in great demand (i.e., oil). Variance and occasional very large movements were certainly evident in the upslope of the production curve. However, the frequency and severity of oil price movements that characterize the variance on the downhill side of the production curve are envisaged to be of a different pattern and order of magnitude. 4. Owing to its singular role in the economy, increased pricing volatility in oil begins to propagate volatility (and thus uncertainty) into the price of nearly everything else. 5. The rising levels of uncertainty in pricing translate into increases in risk of investment. Indeed, due to unknowns in future prices and most especially of oil itself, real financial risks are probably rising exponentially across the board. 6. A knowledgeable and initially small number of insiders anticipate the implications (as outlined broadly in 1 through 5) of moving onto the down slope of the oil production curve 4-8 yrs earlier than the rest of us. 7. With financial risk increasing, and a still small, but growing number coming to understand what is going on, incentive begins to shift from protecting the interests of shareholders, to figuring out how to “cash out” quickly. This shift in incentive may be the fundamental change (of uncertain permanence) that is the cause of Mr. Greenspan’s distress. 8. The behavior of the primary few spreads within the global financial industry and perhaps beyond. Most secondarily affected individuals are probably oblivious to the ultimate cause (i.e., oil price volatility) of their choices and actions. A fin-de-seicle ethos becomes pervasive. There is an unspoken or perhaps even quietly discussed urgency that time is running out for you to make your “nut” (i.e., sufficient money to retire wealthy) and get out. How the "cashing out" occurred is a matter of some complexity. But this part of the story does seem to conclude with tens, and possibly hundreds of trillions dollars in worthless ("toxic”) assets in the "shadow banking system". It is speculated that the primary mechanisms of "cashing out" did not directly involve accumulation of wealth in the "shadow banking system" per se. Instead, the evidence suggests that extraction of value involved the taking of fees, salaries, bonuses, stock options (ugh!) and other mechanisms leveraged against the "toxic assets" by the exclusive few who had access to this huge, but ultimately chimeric pool of capital. Government bailouts of “systemically important institutions” are perhaps the most recent example of leverage against the "shadow banking system". Whatever the specifics of the “cashing out” mechanism – we know the rest – credit crisis, stock and housing market crashes, job losses and the deepest recession of the last 50 years. The “hypothetical sequence” enumerated in 1 through 8 suggest at least 4 propositions for which some data can be derived. 1. 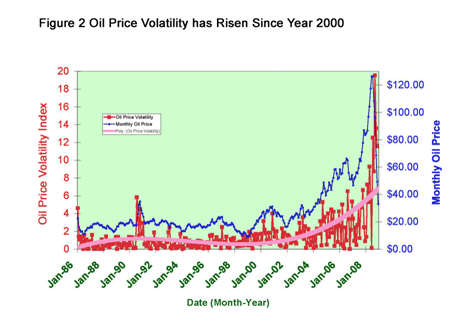 Volatility in the price of oil increased after the year 2000. 2. Variance in the price of goods and services (i.e., inflation rate) after 2000 should show a correlated increase downstream of increasing volatility in the price of oil. 3. Investment risk should rise in concert with increasing volatility in the price of oil and the price of “stuff” in general. 4. And there may have been information in place prior to the 2008 crisis that enabled anticipation of the destabilizing effect of large variances in oil price on investment risk. The author refers to these as the 4 propositions of the apocalypse – a sad attempt at playfulness and definitely in poor taste. Nonetheless, evidence will be provided to support each of the propositions. It is probably fair to point out that even though the propositions imply mechanistic linkages, the actual data presented will generally be correlative. By the way, this essay is based on a longer wiki composed online over the last year or so. This might go some way to explain the accretive, and somewhat clumsy structure of the present essay. The longer (winded) piece can be found at http://ow.ly/hSGb. This site provides “Illinois Basin Posted Crude Oil Prices”. I would expect this data to be similar to that from more commonly used sources, such as West Texas Intermediate prices available from the US Energy Information Administration. The chart in Figure 1 is a plot of monthly crude oil price from 1986 to 2009. The sharp rise and fall in oil at the right hand of the plot corresponding to the oil shock of 2008 is a part of this story that is all too familiar to motorists. The next problem was how to calculate an index in the volatility of oil price based on the monthly data. It was reasoned that this index of volatility should reflect the spread or variability in price over successive intervals of time. To achieve this a simple statistical approach was used. 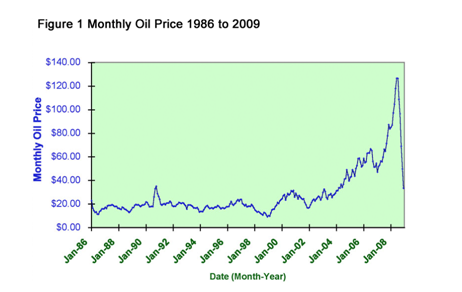 The monthly oil prices for Jan, Feb and Mar of 1986 were $22.50, $16.00 and $14.00 respectively. First the standard deviation (SD) of the first 2 numbers (i.e., $22.50 for Jan 1986 and $16.00 for Feb 1986) was calculated as an index of their spread. This SD was 4.60. Next, the standard deviation of the 2nd and 3rd numbers for (i.e., $16.00 for Feb 1986 and $14.00 for Mar 1986) was estimated to give an SD of 1.41. These calculations were carried out for successive pairs of months for all 276 months from Jan 1986 down to Dec 2008. Figure 2 charts this index of rolling SD in oil price (red) together with oil price (blue). Eyeballing the "seismograph-like twitchings" of the index of volatility indicates that it is on a rising trend, particularly since 2002. An intriguing feature of the volatility plot is large "spiked twitches" that rise notably above background – more on these spikes later. The trend in oil price volatility over time appeared to be non-linear. Microsoft Excel was used to calculate a 3-factor polynomial fit to the scatter plot (pink line – Figure 2). Interesting features of the resulting regression line include that it starts to move notably upward from around year 2000. The trend line also appears to climb in an exponential manner from 2000 through to 2009. In conclusion, looking back from 2009 there is evidence for a rising trend in the volatility of the price of oil that commenced from around year 2000. Proposition 2. Variance in Inflation Rate Should Show a Correlated Increase Downstream of Increasing Volatility in the Price of oil. The monthly year-to-year inflation rates between 1986 and 2009 were used to derive an index of general price volatility in goods and services. Figure 3 shows a co-plot of monthly inflation rate (orange), an index of inflation volatility based on rolling SD of the CPI-U (dark green, calculated as per the oil volatility index), and the regression trend in inflation rate volatility (light green-black core) between 1986 and 2009. From Figure 3 it is notable that the inflation trend appears to reach it lowest point around 1997, slightly earlier than the oil trend – which as shown in Figure 2 is at a nadir around 2000. This lack of coincidence in the lowest point for the oil and CPI-U volatility plots is problematic for the "hypothetical sequence". The hypothesis suggests that oil price variance should be “upstream” of inflation volatility. One can perhaps account for this as a statistical error, the effects of more than one time-dependent factor on inflation, the result of government manipulation and so on. Nonetheless, this discrepancy is a concern and clarification is required. What happens with if "honest" numbers on inflation rate are used? At this site, inflation numbers are described as being calculated using methodologies that were utilized by the US Govt. in 1980s. A site newsletter indicates that this "Alternate Consumer Inflation measure, reverses the methodological gimmicks of the last 25 years". In other words, the site suggests that "cheating" on the way inflation is currently reported by the Feds has been mitigated. When the “Shadow Stats” numbers are used the pattern observed changes significantly (Figure 4). 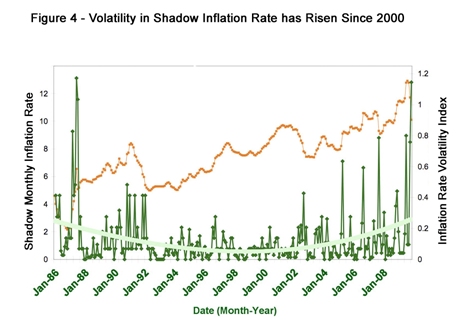 Inflation volatility begins to pick up later into the 2000s than when the index is calculated from the official Govt. numbers (Figure 3). Indeed, it appears that volatility in the shadow inflation rate does not start a pattern of more vigorous "twitching" until after the turn of the millennium. The light green plot of the volatility regression trend confirms a low point for the shadow numbers that occurs around 2000. 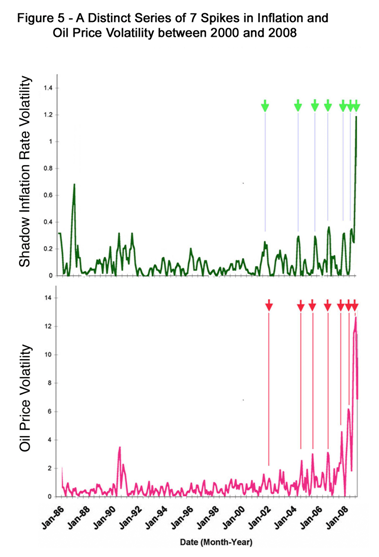 Comparing the volatility trends for oil price (pink line Figure 2) and shadow inflation (light green) indices since the mid 1990s is similar. The rise in the inflation curve now lags a little behind the rise in the trend of oil price volatility. Most importantly, the low points of the curves share a near "coincident bottom" around the year 2000 and from the point of view of the “hypothetical sequence” a near “coincident bottom” is a lovely thing. The results from the shadow inflation index (Figure 4) are thus notably more in line with the predictions of the “hypothetical sequence” than those derived from the “official” Govt. statistics (Figure 3). A previously noted feature of the volatility plots is the occurrence of larger twitches or spikes in variance (Figures 2-4). To improve resolution of these larger twitches, 3-month moving averages of inflation rate and oil price were calculated (Figure 5), and then the volatility indices for inflation and oil were re-calculated from these moving averages. Prior to 2000, spiking in the two "smoothed" volatility indices occurs, but the pattern is irregular. However, after 2000 the spiked pulses of volatility appear to assume an organization. 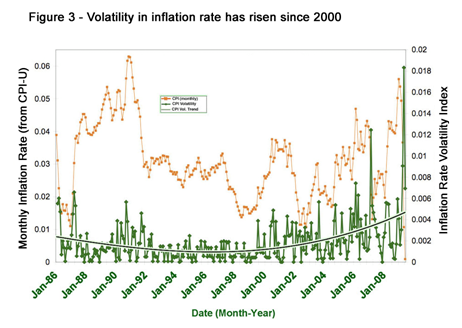 In particular, 6 distinct pulses in inflation volatility are evident in the period (green arrows on top panel) between 2004 and 2009, a recent one peaking in December 2008 being particularly large. An early “harbinger” uptick in inflation instability is also marked on the chart that peaks between 2001 and 2002. There seems to be regularity to the pulsed spikes – and thus a temptation to assume that the sequence is an oscillating wave. However, if one looks at the spaces between the green arrows marking the pulse tops, they are NOT consistent. The time interval between the spikes gets shorter and shorter as 2009 is approached. If this is an oscillating wave, it is rather complex. Now… if one looks at the "smoothed" oil price volatility index over the period between 2004 and 2009, almost the same pattern is seen (lower panel Figure 5). A distinct series of pulsed spikes (red arrows), each spike being separated by increasingly shorter intervals of time. It should be noted that the words "almost the same" are used in the prior paragraph. The reason for this wording becomes apparent when the plots for oil and inflation are overlaid (Figure 6). Although the two patterns are similar, individual "pulse" peaks for inflation and oil do NOT show precise alignment over time. Instead, 5 out of the 6 inflation variance spikes lag slightly behind a pulse in oil price volatility. A further notable feature of the plots is that the volatility spikes tend to show a progressive increase in amplitude. Pulse 2 in oil price volatility is interesting. Its initiation toward the end of 2005 corresponds roughly to the timing of Hurricane Katrina. Many in the US will remember the sharp rise in oil prices at this time and how conventional wisdom focused on the hurricane as the primarily factor causing the sharp ascent in gas price. 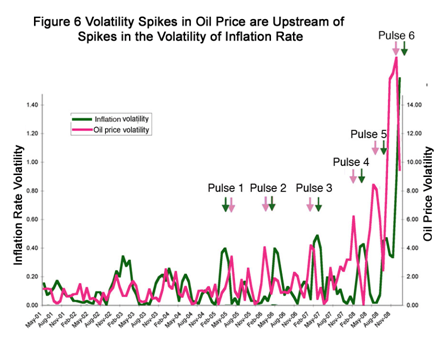 However, the big picture view provided in Figure 5 indicates that the "Katrina-induced" spike in oil price may actually be part of a larger series of volatility pulses, including one that preceded it by a year and a third spike, which followed roughly a year later. As with 2005, 2004 also had an active hurricane season. However, 2006 was comparatively quiet. The point is that while events such as Hurricane Katrina may act as a trigger or catalyst, they are certainly cannot be the ultimate cause of multi-year instabilities of the type illustrated in Figure 5. In conclusion, there is evidence of a correlative link between volatility in the price of goods and services, as reflected in the shadow inflation rate that coincides with increasing volatility in the price of oil from ~2000. 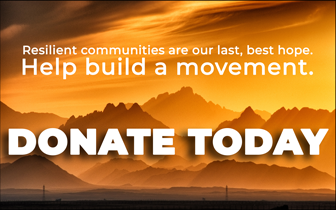 The strongest support for this link comes from a distinct and apparently unprecedented series of pulsed spikes of oil price instability that occurred between 2004 and 2009. Each spike in this series was matched by a coincident or later (downstream) twitch in volatility in the inflation rate. Next, an analysis similar to that developed for Proposition 2 was undertaken on two indices of investment variance: One derived from the S&P 500 stock index and the second based on the price of gold. A co-plot of "smoothed" volatility of the S&P 500 and oil price volatility over the period from 2000 to 2009 can be found at (http://ideas.wikia.com/wiki/File:SnP_Oil_overlay.jpg). The correlation between the peaks of volatility in oil price and stock (i.e., the S&P 500) are not as clean as between the oil and inflation indices over the same period (Figure 6). Between 2000 and 2004, there is turbulent "froth" in the S&P volatility index that presumably corresponds to the residue of the 1990s dot com boom. However, during the key period between 2004 and 2009, the same general pattern of correlated spike peaks observed previously for inflation rate applies. The data shown in Figure 7 provides a more substantive and juicier meal. This plot shows a "smoothened" volatility plot of the price of gold (as measured from http://www.lbma.org.uk/stats/goldfixg – gold in USD) over the period from 2000 to 2009 co-plotted with the plot of smoothed oil price volatility. Gold is an interesting commodity. Historically, it has been treated as a safe haven by investors wishing to protect against inflation. The perception that gold acts as a store of value confers an interesting property on fluctuations in its price. The vigorousness of its movements up and down indicate the sentiment of people of means who are able to buy gold to offset investment risk. To put this another way, volatility in the price gold provides an index of how safe or risky sophisticated investors judge the investment environment to be – a measure of the level of market uncertainty perceived by investors. 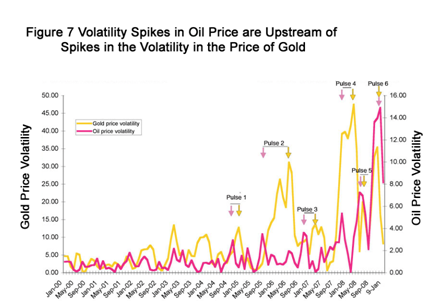 As with oil price volatility, fluctuations in the price of gold show a general rising trend over the period between 2000 and the present (Figure 7). Looking at the detailed geometry of the ups and downs within this trend, it can be seen that a downstream peak in the gold index matches Pulse 1 in oil price volatility. What comes next is a shocker. BANG ! Pulse 2 in oil price volatility (the Hurricane Katrina spike) ignites a huge surge in gold price variance. Its almost as if the pulse 1 was a warning shot and then a second confirmatory slug of oil price turbulence convinces a bunch of savvy investors to run for cover – big time. Pulse 3 in oil occurs and there follows a modest surge in the volatility of gold price. Then the more dramatic pattern repeats. With the rise of pulse 4 in oil volatility, there is second a sharp run up in variance associated with gold price. This large spike in the gold index coincides with the first swallows (vultures?) of the credit crisis: Bear Stearns collapse, Mr. Bernanke assuring us that the sub-prime market is contained and so on. Oil price volatility spikes 5 and 6 follow, with predictable downstream spikes in gold volatility associated with both. The patterns in Figure 7 are astonishing. Volatility in the price of oil appears to be leading investor sentiment – each variance spike heralding large changes of fluidity in the gold market. In summary, evidence is provided for a correlative link between volatility in the price of oil and two indices of investment risk: fluctuation in the S&P 500 stock index and the price of gold. Again, six pulses in oil price instability are generally matched by unitary, downstream twitches of volatility in the stock index and gold price over period between 2004 and 2009. The detailed correspondence between the oil and gold indices is particularly striking. It is concluded the environment for investment over the last 8 or so years has been marked by risk that is increasing in a non-linear, perhaps exponential manner. Proposition 4. Information in Place Prior to the Crisis Enabled Anticipation that Oil Volatility would Increase Investment Risk. Figure 7 provides evidence that long-term hedging in gold was occurring prior to the onset of the financial crisis in spite of the short-term unpredictability of gold as an investment. One reason for this paradoxical phenomenon is that gold is a sensitive barometer of perceived investment risk in the short term. Proposition 4 examines how it came to be understood that oil volatility was adding unprecedented levels of uncertainty to investment outcomes through the 2000s – as reflected in indices such as the price of gold. The main question posed is whether specific information was available that could have led to a change in incentive within the financial industry from protecting shareholders to unregulated "cashing out". Exhibit A in Proposition 4 is Figure 8. It may take a while to study and verify this complex chart. However, once you have familiarized yourself with its implications, your view of how modern economic events are shaped may be changed – perhaps not in a happy way. 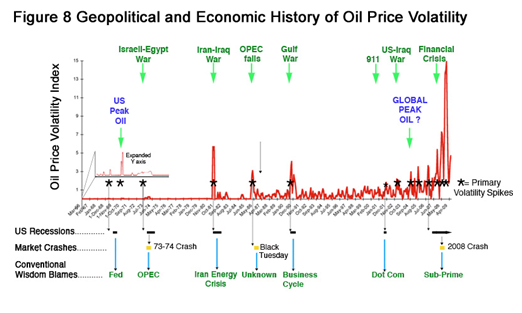 In a nutshell this figure shows that unitary spikes in volatility of the price of oil have occurred immediately downstream to almost all US recessions and stock market crashes since 1966. Put aside the explanations trotted out by experts on the vagaries and fortunes of the US economy – sub-prime, the Fed, interests rates, the business cycle etc etc etc. Figure 8 teaches that the single factor common to virtually every US recession and market crash for nearly half a century is that each has been preceded by a prominent transient spike of instability in the price of oil. The one exception with no preceding variance pulse is the shortest recession of the period, which occurred in 2001 in the wake of the dot com bubble in technology stocks. There is debate as to whether dot com actually met the formal definition of a recession, as it did not comprise 2 successive quarters of negative GDP growth. Semantics aside, it is notable that a minor volatility spike was coincident with the dot com “recession”, so the 2001 downturn might be considered as not inconsistent with the general pattern. Looking at Figure 8 in detail, the now familiar recent 6 volatility spikes of 2000 to 2008 can be seen at the far right of the plot. Each of these transients in price variance are asterisked and referred to as "primary volatility spikes". A new, more recent pulse can be observed to be building during 2009. While the 2009 upstroke shows signs of flattening, it has already risen to the point that it is the 5th largest spike in oil volatility of the last 50 years. The left hand of Figure 8 covering the period between 1966 and 1980 provides food for thought. Against the background of the turbulence of the last 10 years the volatility transients (asterisked) in this era are almost imperceptible. However, by expanding the Y-axis (right hand inset) we can see definite nubs of variance that coincide with the oil shocks of the early 1970s. And these were indeed “primary volatility spikes” in the context of their era, as they rise above a background which maintained at near-zero levels until ~1980. It should be noted that the oil markets were heavily regulated by commercial and government interests during this earlier period. Hence, although squelched, volatility appeared to squeak out in spurts when it could no longer be constrained. All the same, two official recessions and a stock market crash can be recognized proximal to and downstream of notable volatility spikes between 1966 and 1979. The period between 1980 and the early 1990s is fascinating. Within this time-frame three recessions and one stock market crash occurred. Again the "one on one" and upstream relationship of “primary volatility spikes” to economic events is maintained. Perhaps the most interesting event in this time-frame is the stock market crash known as "Black Tuesday". The crash that began on Tuesday the 19th of October 1987 appeared to come out of nowhere, occurring during a period of steady gains in growth in the US economy. While "Black Tuesday" remains the greatest single-day loss that Wall Street has ever experienced, no convincing answer to what caused it has ever been forthcoming. There are speculations on the role of computer trading, herd behavior by market players and derivatives. 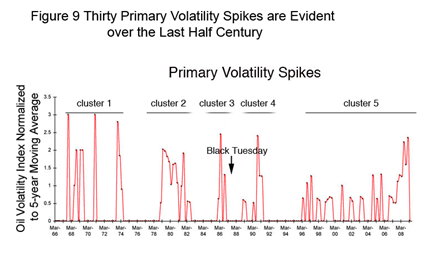 In the historical perspective provided by Figure 8 it can be seen an overlooked factor in “Black Tuesday” is that a large oil volatility transient peaked shortly prior to the 1987 market crash. This spike was caused by a failure of OPEC to stabilize prices owing to "cheating" by cartel members on production quotas. The honorable Saudi’s tired of their role as a production "buffer" to counter misbehavior by OPEC siblings and temporary chaos (and hence volatility) ensued in the oil markets. "Black Tuesday" may turn out to be one of the most significant lessons in the dark arts of the markets ever. It came like a meteor in a time before telescopes or knowledge of heavenly bodies. Its singularity and inexplicably is the "exception proving the rule" that wakeful scientists are always on the look out for. The unexpectedness of this stock market crash spared it a tidy accounting by the press and the mendacities of conventional wisdom. With the context provided by figure 8 that "Black Tuesday" was the immediate downstream product of an unusually large spike in oil volatility now becomes a reasonable proposition. Indeed, it may be the only explanation that makes any sense – a precipitous induction of investment risk by an oil variance pulse in the absence of an economic downtown. In other words, OPEC gave us an experiment on the effects of a “primary volatility spike” controlled for the confounding influence of an accompanying decline in US GDP. It is speculated that inquiring minds watching these events as they unfolded over 20 years ago may have become early adopters of the conclusions regarding transient instabilities in oil price and investment risk outlined in this essay. The insights provided by the oil shocks of 1970s probably laid out the principle for anyone motivated enough to recognize the pattern. Oil volatility pulses at the beginning of the 1980s and the 1990s provided further confirmation of a correlation. But in these cases, one could have argued that the risky investment environment resulted from the economy being in recession. But "Black Tuesday" sealed the deal, by showing that a primary spike in oil price variance was sufficient, in it own right to propagate uncertainty into investment markets, even during periods of steady, positive growth in GDP. In the penultimate step of the data section, an attempt will be made to "drag the beast" into the "light of day". The root cause of our economic woes is postulated as to what the essay now refers to as a “primary volatility spike” – a large, transient variance in the price of oil. It is suggested that “primary volatility spikes” can be thought of as a class of discontinuous phenomena in their own right within the broader category of volatility. The focus here is on oil, but as has already demonstrated, other economic variables (e.g., inflation rate) over the last 6-7 years have also displayed similar discrete spikes. The ability of large transient variances in oil price to cause economic shock appears to some extent to be dependent on the era in which they occurred. For example, relative to those of the last decade, the magnitude of spikes in the 1970s was small (e.g., inset Figure 8) – nonetheless the dire economic ramifications of these shocks are all too well remembered by anyone over the age of 45. A simple arithmetic device was used to generate a visual representation of the relative magnitude and frequency of “primary volatility spikes” over the last 43 years. 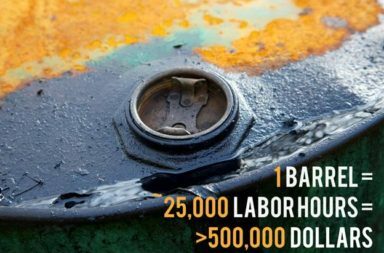 To do this, rolling 5-year averages were calculated from the oil volatility index from 1966 through to 2009. The rolling average for each month was then used to divide the volatility index at the corresponding point for all months between Jan 1966 and Jan 2009. Figure 9 charts the results of this "normalization" of the time series. The plot brings into the "light of day" some 30 “primary volatility spikes”. Within the 43-year time span, these 30 or so spikes are clustered roughly into 5 groups. The first cluster of spikes is in the early 1970s, corresponding to the period in which US "Peak oil" occurred, and the second, third and fourth clusters are centered on the 1986 "Black Tuesday" spike. The fifth, largest and most recent cluster has been the main focus of this essay. One surprise outcome of "normalization" is that it provides evidence that the latest (i.e., fifth) cluster of instability in oil pricing may have started in the mid 1990s, rather than in the early 2000s as was indicated from earlier charts in this essay. If this earlier onset is the case, it has interesting implications. For example, it could be that the initiation of cluster 5 is diagnostic of the aftermath of Hubbert’s peak. If this were the case, then it would lead to the surprising inference that the worldwide crest in oil production occurred prior to 2004. Alternately, Steve from Virginia has previously made the observation on The Oil Drum that oil price in inflation-adjusted dollars reached its minimum in about 1998-1999- a time that he refers to as "peak oil availability". After this time, it was speculated that as demand grew, supply was not able to keep up, and the effect was felt in price, rather than in increased production. Steve’s hypothesis perhaps provides a more plausible explanation of the increase in price variance after 1996 shown on Figure 9 and this interpretation would also be more in line with an emerging consensus that Hubbert’s peak probably occurred 2004-2005. Figure 10 returns us to the theme of this essay: the effect of volatility in the price of oil on investment risk. Gold was fingered earlier on as an indicator of perceived market risk by sophisticated investors. 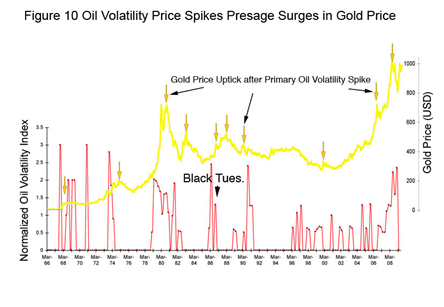 Figure 10 provides a nice illustration of how “primary volatility spikes” tend to presage surges in the price of gold. Using this chart it is straightforward to surmise which is the likely "horse" (Therramus suggests the oil volatility spikes) and which is the "cart" (gold price) of the pair. A small upward blip in gold price (yellow arrow, Figure 10) can even be seen to occur prior to the "Black Tuesday" stock market crash. But consistent with the hypothesis outlined in this essay, this rise in gold price and the large market crash of the following October, both occurred after the initiation of the 3rd cluster of oil price variance spikes. Finally, note how the start of the fifth and most recent cluster of volatility in the late 1990s precedes the kick-off of a relentless climb in the value of gold over most of the 2000s. If you’re curious about what happened to all that money lost during the financial crisis, then one perhaps does not have to look too much further than this veritable mountain of gold with its foothills nestling in the year 2000. 3) the aggregation of wealth by prescient actors in "value stores" such as gold. Divining the cause or causes of the financial crisis 2008 is a problem that perhaps should be approached with trepidation and humbleness. It is easy to be off track when there are so many unknowns. The workings of complex systems such as the economy are ineffable… and well… complex. Conventional wisdom has already coalesced around a number of probable causes. Top of the list is the hubris and greed of Wall Street. The sub-prime mortgage market is a second much vaunted cause of the crisis. Attractive as these popular explanations are, this essay imagines an ultimate cause for the financial crisis that differs from the emerging conventional wisdom. At its most essential, this narrative is about the primacy of the laws of physics. Human frailties such as greed are viewed as a necessary, but not sufficient factors in the crisis. Similarly, the sub prime mortgage market and its devilish cousin the “shadow banking system” are seen as downstream manifestations of the deeper process of resource depletion. This being said, one does not wish to absolve the excess of the financial industry. These people demanded to be treated like adults and left to self-regulate. Unfortunately, in the absence of vigilant supervision the moral pygmies of Wall Street took to playing with matches and eventually burnt the house down. It should be emphasized that the hypothesis posed here does NOT constitute an organized conspiracy. Those caught up in the fin-de-seicle mentality that lubricated the financial crisis do not have to know each other or openly share their concerns. Given the right seedbed, timely ideas propagate like weeds. Simply put, the idea proposes that economic disruptions wrought by instability in the price of oil leading up to and following Hubbert’s peak provide a key to understanding the financial crisis of 2008. Pricing unpredictability in oil – our most fundamental energy resource – is suggested here to be the sole factor that is both necessary and sufficient to explain the debacle. All else, bad behavior of Wall Street included, is proposed to self-organize and flow downstream from the effect of volatility in the price of oil on investment risk. Therramus is a neutered Tom. He can be contacted at [email protected].